We have built a wide rande of styles of batch furnaces and ovens over the years, including these heat treating furnaces and forging furnaces. Visit our photo gallery for more Batch Furnace and Oven photos. Kleenair Products Co. are the batch furnace and batch oven experts. We’ve been providing reliable, high quality, high performance batch furnaces and ovens for more than 50 years. Our batch furnaces are completely custom-designed and -built to match our customers’ application and performance requirements. Contact us today to get started on the custom batch furnace you need. 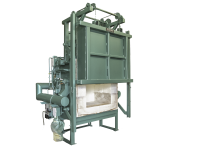 Kleenair provide some of the best and most dependable batch furnaces on the market today. Exclusive, proprietary features give them unrivaled performance and usability for easy and reliable operation in even the most challenging applications. All our batch furnaces meet NFPA 86 and OSHA requirements. We manufacture the industry’s best door seals, door hinges, and door actuators. These components play a huge role in the performance and temperature uniformity of a batch furnace, and, while our door components are often imitated, they’ve never been duplicated. For reliable thermal seals, durability, and fast, easy action, Kleenair’s furnace door components can’t be beat. All of our custom batch furnaces include advance control systems for outstanding ease of use. Customized HMIs (human-machine interfaces) provide all the control capabilities your process requires, with no extraneous features that you’ll never need or use. Engineered for intuitive operation, our control systems can also be connected to your facility’s computer network for remote use. 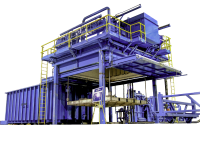 Automated load manipulators and other material handling systems can be included in your custom batch furnace for improved usability, productivity, and versatility. Our batch furnaces provide high temperature capabilities, up to 3,250°F (1,800°C). As your application requires, they can be engineered for Class 1 through Class 5 temperature uniformity. 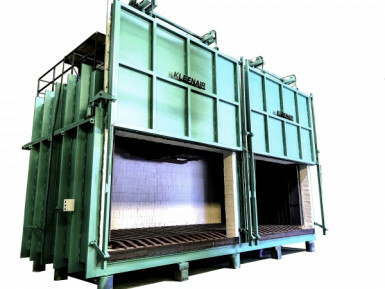 Car bottom furnaces are ideal for processing very large/heavy parts that are loaded via overhead crane. A wheeled car (or cars), riding on floor-mounted or embedded rails carries the load into and out of the furnace. 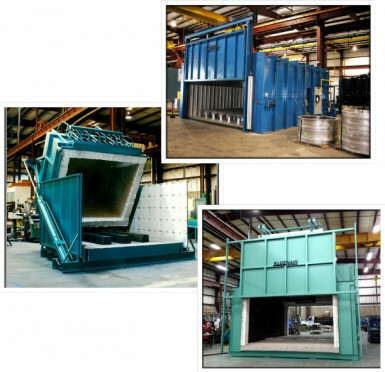 Box furnaces offer versatility for processing materials of all shapes and sizes. Single or double overhead lift doors make it easy to load and unload materials for processing. With a lid that tips back for very fast loading and unloading, tip-up furnaces are a perfect solution for high temp quenching applications. Our proprietary high speed actuators provide some of the fastest opening times available. Our drop bottom furnaces are specially designed for solution heat treating of aluminum and other similar processes. High speed sliding doors and powerful, self-contained elevator systems allow treated materials to be fully lowered into the quenching bath in as little as 10 seconds. We are the proven experts in custom batch furnaces and batch ovens. We can design, engineer, manufacture, and install a custom batch furnace that matches your exact application and performance requirements. Request a quote on a custom batch furnace/batch oven or contact Kleenair to discuss your project.